Best desktop system for £2000 | What Hi-Fi? In fact, to create a great-sounding system, you just need the right elements. In this case, you’ll need an Award-winning Audiolab DAC that is talented enough to make your laptop-stored music shine, and a pair of Grado headphones to enjoy a winningly airy, engaging and punchy sound. As far as systems go, this is a sleek and compact set-up. The 13in MacBook Air is Apple’s thinnest, sexiest laptop yet, and we’ve long been fans of the Audiolab M-DAC’s smart looks and compact, stylish design. The Grado SR325es also add a touch of ruggedness, but then some of us rather enjoy looking like a 1950s radio controller. The MacBook Air is a gorgeous machine. It looks sophisticated perched on a desk, and the M-DAC looks natural sitting right next to it. The silver aluminium chassis matches the silver finish of the laptop, but you can also get the M-DAC in black. The M-DAC is kitted out with USB type B and twin optical and coaxial inputs, while the MacBook Air takes a more minimal approach, offering two USB ports and a 3.5mm headphone socket. Both products are impeccably built. The M-DAC’s 2.7in OLED display is crisp and easy to read. The MacBook Air doesn’t have a Retina display, but the screen is nevertheless sharp, crystal clear and bursting with rich colours. We like using MacBooks in particular for their smooth operation and slick interface – crucial if you’ll be using this system every day. The M-DAC comes with a wand-like responsive remote, but we find it much easier just to reach over and twiddle the control dial (which has a lovely smooth response) or push the buttons to control this desktop DAC. It’s a good thing this is your home system, as these Grado headphones are as leaky as a faulty colander. This would be a problem if you were out and about, but in the privacy of your home you can listen to ’80s hair metal and bubblegum pop without annoying others. Or embarrassing yourself. Don’t be put off by the Grados’ steely, no-nonsense design, either. No, they’re not as stylish as rival headphones at this price, but they are built to last. These cans will survive more than a few knocks and scrapes, the ear cups rotate 360 degrees without creaking, and the thick cable is sturdy and effectively designed to remain tangle-free. They do feel heavy at first, but the headband and foam ear cups are surprisingly light on the head. Crucially, they don’t grip too tight, but neither will they fall off easily, and the airy foam cushions ensure your ears don’t get hot over long periods of listening. The Grados have a 6.3mm plug that neatly slots into the M-DAC’s headphone port. Connecting the MacBook Air to the M-DAC is almost as easy. You can connect via USB or optical, although bear in mind that those inputs limit file support to 24-bit/96kHz. Those wanting to play full-fat 24-bit/192kHz files will have to use the coaxial input. Apple’s closed ecosystem insists on using iTunes to play all tracks, but it doesn’t support certain formats, such as FLAC or DSD files. There’s a way out of this: you can download alternative music players that can cope with a wider range of file types. They often sound better than iTunes, too. The Air’s 256GB onboard storage isn’t massive, but will hold a few dozen high-res albums. If your music collection keeps expanding, a neat solution is to get a NAS box that rips CDs. 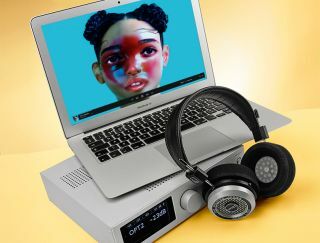 That way, not only do you gain vast amounts of space to store your music, you can also stream those songs straight to your laptop – provided both devices are connected to the same network. There’s no ethernet port, but there is a USB adapter as well as wi-fi and Bluetooth. Streaming services such as Tidal and Spotify work smoothly once we’re connected to the internet. More pressing, however, is the absence of a CD drive: how are you going to rip all your CDs? Well, you can get a separate USB SuperDrive (£65 from the Apple Store), or invest in that NAS box. Start listening and you’ll immediately hear why the Audiolab has been our favourite DAC for years now, and why we love clapping those industrial-looking Grados over our ears. It’s a remarkably clear and airy sound, packed with sky-high detail, precise edges and effortlessly agile rhythms. We did test this set-up with a variety of headphones, after which the rich, smooth and wonderfully plush Sennheiser Momentum 2.0s nearly took the SR325es’ spot in this system. But there’s no turning back once you hear those Grados. Leaky as they are, they’re instrumental in delivering the wonderfully open sound of this system. The sense of scale and depth in Inception’s Time is impressive, and there’s no limit to how deep and how high the instruments can go. Dynamically, the music soars freely and reaches peaks without ever sounding restrained. You won’t get that kind of clarity and openness with a closed-back headphone design. This trio has a great grip on rhythm, too. The blues-tinged guitars on Songhoy Blues’ Soubour sound taut and funky, and the system breezes through the upbeat tempo with a light but speedy and controlled touch. It’s a lively, expressive performance. There’s a muscular depth to those jangling strings, but it never bogs down the tune. Basslines have texture and rumble deep, while the top end sparkles. It’s an attacking, punchy sound that maintains its urgent delivery without ever veering into sharp or brash territory. The system further proves its worth when we listen to a lossless FLAC file of Marilyn Manson’s Killing Strangers via recently relaunched streaming service Tidal. It certainly doesn’t shy away from delivering the crunch and rasp inherent in the track, while every vocal nuance and drawl is laid bare. Despite that edge, there’s a smoothness to the sound that doesn’t take away any of the subtlety or attack from songs – a forgiving approach that works well with streaming services such Tidal and Spotify. Not everyone has the space for a dedicated separates system or is freely able to blast music out loud. Laptops, downloaded music files and streaming services are becoming increasingly popular ways of listening to music, and this system proves you don’t have to break the bank or sacrifice much space or effort to create a system that you can use at your desk and that won’t compromise on sound quality. Musical, insightful and full of attack – this is one classy, talented system that you can be proud of.